This retreat has several verandas and overlooks built to provide ample wildlife-watching opportunities from every angle. 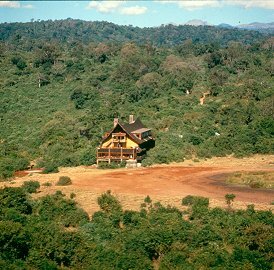 Situated next to one of the largest Aberdare Mountain salt licks, at the Yasabara waterhole, the Ark Lodge also provides a game-viewing shelter for snapping shots of the many African forest species of the region. Yasabara is lighted for nighttime creature spotting, and there’s an expert available to answer flora and fauna questions. 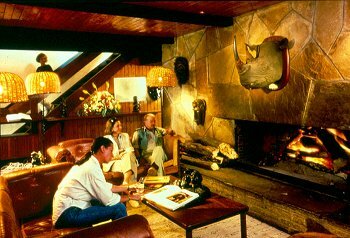 A buzzer system in each room alerts guests to special sightings at the waterhole, like an appearance by a leopard. Accommodations feature scenic panoramas of the woods or watering hole and en-suite bathrooms. 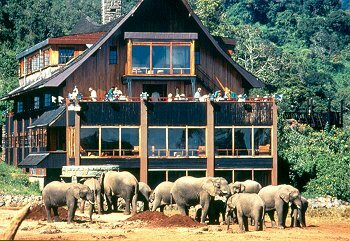 Restaurant, Bar, Lounge, Viewing Decks, Photographic Hide, Catwalk, Private Salt-Lick and Waterhole, En-Suite Bathrooms.